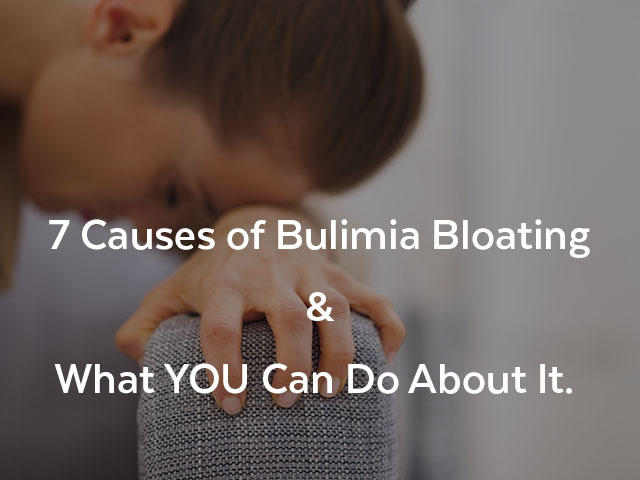 If you’re experiencing bulimia bloating, you are not alone. It’s quite probable, because of the causes of bulimia bloating, everyone with bulimia will experience it at some time or other. And especially in the early stages of recovery. However, as you’ll discover in this post, there is a lot you can do to alleviate and perhaps even prevent it, moving forwards. Bulimia bloating does not equate to getting fat, being fat, or ‘real’ weight gain: Any weight gain from bloating is temporary. For most people, bulimia bloating does not last. (Although for some people, the side effects of bulimic behaviours can cause long-term issues with the gastrointestinal tract, including bloating). when bulimia bloating hits, it can be incredibly challenging physically, mentally and emotionally. Not only has your belly ballooned into a rock-hard ball, making you look several months pregnant so nothing fits, it’s incredibly uncomfortable, often very painful and sometimes embarrassing. The swelling can be quite rapid and sudden, triggering all sorts of scary thoughts and feelings, not just because it can make you feel fat or believe you’ve gained weight, but because it can make you feel unsafe and vulnerable and even wonder if there is something seriously wrong. Canceling arrangements last minute because I was in too much pain, nothing fitted, or I felt too fat to be seen. Undoing the button on a skirt or letting out a belt, one hole, two holes, sometimes four or five holes, to accommodate a belly that seemed to have taken on a life of its own. Times when I could barely stand up straight and one time even being carried out of a restaurant. Equating the bloating with being fat or gaining weight. Feeling totally let down by my body and that I couldn’t trust it. All too often those thoughts, of being fat or let down by my body, would trigger a “WTF” moment and I’d binge and purge. And, all too often I’d slip into the mindset that recovery just wasn’t worth it and end up relapsing. Needless to say, I’d be super upset and frustrated with myself. Perhaps my experiences sound familiar? Making Bulimia Bloating less scary. Allow you to have some [much needed] compassion for yourself. Speed up your recovery efforts. Medical disclaimer. Please remember I am not a doctor. The content of this post or any other on bulimiafree.com is not or should not be interpreted as medical advice. If you have any medical concerns or symptoms, please see your doctor. 1. Dietary Restriction, Purging, and Bulimia Bloating. Any form of dietary restriction and or purging will, over time, lead to an energy deficit in the body and malnutrition. In response, your body’s metabolism slows down and digestion is disturbed. You may not have considered this but your body needs adequate energy (calories) and nutrition for effective digestion. Poor food absorption and assimilation; perpetuating a lack of energy and nutrition in the system, causing more bloating and digestive distress. Regular vomiting causes the pH balance of the stomach to become too alkaline, not only is effective digestion further compromised but the vital electrolyte balance can be disrupted, leading to further issues and complications. Now you might think you are eating enough and you might be. But it’s also possible you’re not! You see as part of your recovery, it’s quite likely that some kind of cellular repair is necessary to strengthen your digestion and gastrointestinal tract. And for this INCREASED ENERGY AND NUTRITION (aka Food) IS A NECESSITY. Perhaps you can see the dilemma here? Any increase in food intake is going into a depleted system. With digestion and assimilation weakened, perhaps dramatically so, particularly if you’ve been struggling with bulimia for a long time, or it’s been severe, or you’ve had anorexia, discomfort, and bulimia bloating is likely. Because of the physical discomfort of bulimia bloating, it is possible you may stop eating before you’ve eaten enough. (Which may trigger bingeing later on). And because of the psychological distress; increased anxiety and negative body thoughts around food and meal times, you may become fearful of food and develop a resistance to eating and or, purge after eating. BUT EATING ADEQUATELY & CONSISTENTLY OVERTIME IS A MUST IF YOU ARE TO RECOVER & BE FREE. So, unfortunately, whilst it’s likely there will be some, maybe a lot of discomfort and distress during recovery because of bulimia bloating, you will not escape it by continuing with the behaviours of restricting, binging and or purging: Not just that, you are likely to make things a lot worse for yourself. Before you see any real benefits of recovery, you will first have to take on some really challenging days. Winning those challenging days will serve to make you stronger. 2. Water Retention and Bulimia Bloating. The body tends to retain water whenever there is dehydration: And because all forms of purging; vomiting, over-exercising, laxatives and or diuretics, cause dehydration, water retention is common in bulimics along with the accompanying bloating. This can be exacerbated if there have been disturbances in the electrolyte balance, a common side effect of purging. Water Retention Speeds Up The Repair Process of The Body. You may also experience bloating due to the body’s tendency to retain water, particularly around the site of [cellular] repair, as fluid allows nutrients and waste to travel more effectively in and out of the cells. 3. Anxiety, Stress and Bulimia Bloating. It might seem strange that anxiety and stress can cause bulimia bloating but because the brain and the gut are connected by the central nervous system, you cannot separate what is happening in the brain, with regards anxiety and stress, and what happens in the gut. Whenever the brain perceives a threat to your survival, or there’s some kind of anxiety or stress and or low blood-glucose concentration, the flight-fight mechanism is activated and cortisol is released. Bulimia is a threat to your survival. Low blood-glucose is induced by not eating enough, ‘starving’ yourself or bingeing then throwing up. And whilst recovery is not a threat to your survival, it can be stressful. Now cortisol isn’t ‘bad’: It is a vital part of the flight-fight mechanism, that diverts blood from the digestive system to the muscles, so you can flee or fight. But because this threat or stress isn’t external, you don’t fight or flee and the cortisol remains in the system. And to a lesser or greater degree, depending on the individual, digestion is disrupted and slowed down, resulting in bloating and or constipation. A weakened and compromised gastrointestinal tract can lead to food allergies, sensitives or intolerances, all of which can cause bloating. Working out potential food allergies or sensitivities is tricky and time-consuming (although your eating disorder might like it as it). What if it is not the food itself, that is the real problem? What if it is the bulimic behaviours that have lead to imbalances and disturbances in the gastrointestinal tract? You see it is quite likely if it weren’t for bulimia, your gastrointestinal tract that would be perfectly capable of dealing with any food*. For information on this see “Strategies To Reduce or Alleviate Bulimia Bloating” section below. *It is possible for food allergies and sensitivities to cause an eating disorder because of the elimination and restriction. Constipation is probably the most obvious go-to reason why your belly is bloated which can lead to an overuse of laxatives However, it’s constipation is the end result of a compromised, ineffective and sluggish Gastrointestinal Tract and dehydration, that needs nourishing and hydrating, not more and more laxatives. Do you feel anxious and or guilty when eating? If so, it’s quite likely you are eating too quickly, which may have you ingest air at the same time: Air that sits in your stomach, resulting in bloating. Chewing gum can also cause bloating because of the tendency to ingest air as you chew, as can breathing in through your mouth when exercising. When struggling with bulimia, it’s very common to have interrupted or too little sleep. As you may have experienced, too little sleep is stressful; physically, mentally and emotionally, especially to a body and brain that are already distressed and depleted. The resulting raised cortisol level that lingers in the body may disrupt digestion, causing bloating and can further interrupt sleep. The Bad News & The Good News on Bulimia Bloating. If you have bulimia you are likely to experience bulimia bloating to some degree. However, the GOOD NEWS: There’s a lot you can do to alleviate bloating and possibly even speed up the time you experience it in recovery. The thing is, there is no set answer. Duration and severity vary from person to person. However as I mentioned above, there is a lot you can do about bulimia bloating to make you feel far more empowered in the matter and support your recovery. NOTE: Keep in mind, bulimia bloating is ‘normal’ given the circumstances, however, it’s a good idea to visit your doctor, particularly if any pain is severe and or prolonged. Accept The Bloating & Allow It To Be: Resisting it or wishing it wasn’t happening, creates a whole lot of thinking all focused on the problem. This actually makes it (and you) feel so much worse. Remember, anxiety or stress will cause and or increase bloating. 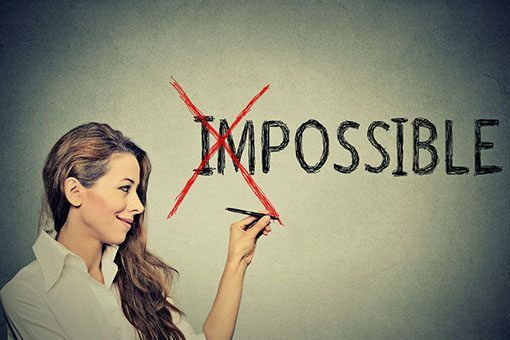 Perhaps you have heard the saying, “What you resist, persists”? “Reframe” the bloating. As bulimia bloating is more prevalent in recovery, either because you are increasing your food intake or keeping it down, see it as a symptom of recovery, a sign your body is healing and balance is being restored. And send healing your body some healing thoughts. With a little practice, you should notice yourself feeling calmer and more relaxed, within a minute or so. TIP: Practice the breathing technique in Strategy 7 as part of a daily strategy to alleviate anxiety whilst at the same time making it more effective when you are actually experiencing any bloating. Awareness: Understand how certain beliefs and assumptions you have about your body, eating and the bloating itself, may actually be worsening your symptoms and perpetuating the pain. Feeling hungry is ‘bad’ (it’s not). I know it can make you fearful of bingeing but feeling hungry means you are low on energy and it is time to eat, not a time to binge. Feeling full is a signal to binge and or purge (it’s not). Feeling full is a normal and expected feeling of eating and signals the time to stop. Dump the scales and measuring tape. Drop weighing yourself or your food. Forget counting calories and reading ingredients on the backs of packs and bottles. STOP dieting and listening to what others say you should or shouldn’t eat and START listening to ‘the best nutritionist in town’, your body. Be Committed to your recovery, to your freedom, above all else. ALERT: Bulimia bloat can seem a ‘rational’ reason to binge and or purge but don’t be tricked, this is the ‘eating disorder voice’; following through on that thought, will only perpetuate the problem. STAY STRONG. How to manage that eating disorder voice is something I cover in depth in my coaching programs, as it is probably the biggest hindrance to a successful recovery. Eat regular meals and snacks throughout the day. Each day. Every day. And be purge free. Eat nutritionally balanced meals with a variety of protein, fats, carbs and fresh vegetables and fruit. Remember fuelling your body with adequate calories and nutrition heals your body. It increases the energy in your body and strengthens your digestion It also reduces bingeing and anxiety and will resolve many of the symptoms and side effects of bulimia. Avoid eating the same ‘safe’ food over and over again, even so, called ‘healthy’ foods. This way of eating doesn’t really keep you safe, it can cause malnutrition, a weakened gastrointestinal tract, food sensitives, intolerances, even allergies and bloating. As your digestion gets stronger, you’ll find your body more able to deal with all foods. As much as you can avoid overly processed foods, this includes ‘diet’ foods and sodas, particularly those containing fake sugars such as sorbitol, mannitol, xylitol, lactitol, and maltitol. These fake sugars are known to cause bloating. If you are someone who has difficulty digesting fructose, you may want to avoid eating too many fruits and smoothies that contain a high ratio of fructose to glucose, for example, apples, pears, watermelon, and mango, as they can cause gas and bloating. High fiber foods can also be problematic when digestion is weak and the passage of food through the gastrointestinal tract is slow: There is more time for fermentation and gas production. So, notice how your body reacts to fiber and respond accordingly. TIP: STOP all ‘dieting’ or any form of food restriction even those that appear ‘healthy’ and START following a “Structured Eating Plan”, an effective, proven strategy for recovery that works on many levels. Structured Eating and Meal Planning has formed the basic foundation for the full and lasting recovery of many people, including mine. And you’ll be healing the causes of bulimia bloating at their roots. Bulimia Bloating Strategy #3 STOP Purging. STOP purging. Whether that is throwing up, over-exercising or overusing / abusing laxatives and diuretics. It needs to become a non-negotiable behaviour: And the sooner the better. Not only does it help prevent bloating it also helps to stop bingeing. ‘Come to the table’ and eat in a relaxed state of mind. You may be surprised to know, digestion and assimilation of your food are not so much about ‘what you eat’ but more about ‘HOW YOU EAT’. Digestion and assimilation happen best when the body and mind are relaxed. Now feeling relaxed probably isn’t your experience with food and eating. However, it is possible for you to induce a relaxed state by simply [consciously] changing and focusing on your breathing. You’ll find a short and simple breathing exercise in Strategy 7. Although simple it is not so easy to do, however, the benefits are well worth the effort. Support your gut function with some probiotics. Probiotics (pills or powder) can put some ‘good’ bacteria back in the gut as can certain foods** and therefore help to aid digestion. **Fermented foods such as kombucha, kimchi, miso, sauerkraut can be beneficial. However, if you’re dealing with a yeast overgrowth, a probiotic supplement may be a better choice. If you’re not dairy intolerant, you could try whole fat milk from grass-fed cows or organic yogurt. If you are, unsweetened sheep or goats milk or yogurt may be a good alternative. ALERT: There is some controversy about the effectiveness of probiotics. So, do your research as to whether you think they are right for you and which one is right for you. Everybody is different, so seek professional help if you’re unsure. Drink herbal teas like peppermint, fennel or ginger to aid digestion. Bulimia Bloating Strategy #5 Stay Hydrated. Drinking enough water regularly throughout the day, every day will help to not just hydrate your body but also bloating and can help release weight caused by water retention. However, avoid drinking a lot of water at any one time, the cells of your body do not like to be drowned. Sliced ginger, lemon or fresh mint to hot water. Sliced fruits, such as lemon, lime or orange or cucumber & strawberry to cold water. Coconut water is delicious and also has a number of important electrolytes such as potassium and magnesium. Physical activity stimulates the muscles of your digestive tract, which helps move food and any air bubbles that make you feel bloated through your gastrointestinal tract. So, taking some gentle exercise, like walking or swimming or yoga should be beneficial. Good self-care reduces stress, anxiety and even depression. Cut yourself some slack and BE kind to your Self. TALK kindly to yourself (self-talk) and about yourself to others. Get enough sleep. Get enough rest and get enough down or chill time. If and when necessary, if you want a snooze in the afternoon and you can, then snooze: It’s not lazy but healing. Learn to ‘listen’ to what YOU want or need to do and how to say “No” powerful but politely. Reduce anxiety and stress levels by practicing a deep breathing exercise to induce the ‘relaxation response’ to move your body and mind into a calmer state and to support your digestion. Simply by exhaling for a few counts longer than inhaling, (several times), something you can do anywhere, anytime, can do the trick. However, if you incorporate a breathing exercise to induce relaxation into your daily routine, you will get the most benefit. – but it works best, that is you get the desired result when practiced consistently over time). You may want to consider relaxation, yoga or meditation classes or perhaps listen to some relaxing music. Wear loose clothing or things that don’t cut across your waist like belts, tight jeans and skirts, particularly if you’re sitting down for a long time. I used all the above strategies when I was on my journey to bulimia freedom as do my private clients. Individually they all help, collectively they provide a powerful and effective way to not just reduce bulimia bloating but support bulimia recovery in general. Fantastic – thank you. It was the best piece of writing I have read over thirty odd years of fighting with bulimia.